Matt Bevin Wins in Kentucky! FRANKFORT — James Comer conceded, Matt Bevin accepted and Kentucky’s race for governor finally got underway Friday following a tumultuous primary that left Democrats giddy and Republicans focused on uniting their scattered base. Comer, the state agriculture commissioner, conceded a day after a review of election results confirmed he lost to Bevin by 83 votes in one of the closest statewide elections in history. In a news release, he “enthusiastically” endorsed Bevin and promised to do everything he can to help him win in November. The race now pivots to November, where a pair of failed U.S. Senate candidates will face each other in a rare off-year election for an open governor’s seat. It’s happening in one of the few states that still has a thriving two-party system, making it an indicator of sorts for the 2016 presidential election. Democratic nominee Jack Conway is the state attorney general who lost to U.S. Sen. Rand Paul by 11 percentage points in 2010. 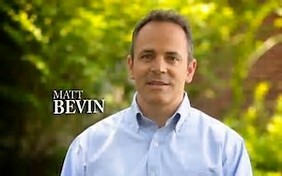 Bevin is an investment banker who has never held public office but famously lost badly to U.S. Sen. Mitch McConnell in the 2014 Republican Senate primary.